What does jihad mean ? Since 9/11, it has become the rule to amalgamate Islam and terrorism. Islam is henceforth considered a viscerally violent and warfaring religion. A collection of words ending in « ist » are used to qualify Islam today. Terrorist, fondamentalist, obscurantist, radicalist, jihadist… A war of words is waged upon the Islamic faith, classifying it as a pathology and modelling the consciences of the masses. In this text I suggest re-considering the real meaning of the word « jihad » in Islam. All the more as the jihadist argument is becoming worryingly widespread and that terrorism and islamophobia go together in the present context. A certain number of negative clichés and rumeurs exist concerning Islam and the Muslims. These prejudices come from an ignorance of the islamic religion, of its thinking and its peaceful and tolerant vocation. However, in order to break down the prejudices and to avoid just keeping only an essentialist vision, we need to define the concepts of Islam on the one hand and the concepts of jihad on the other, and to reposition them in their historical and political contexts. 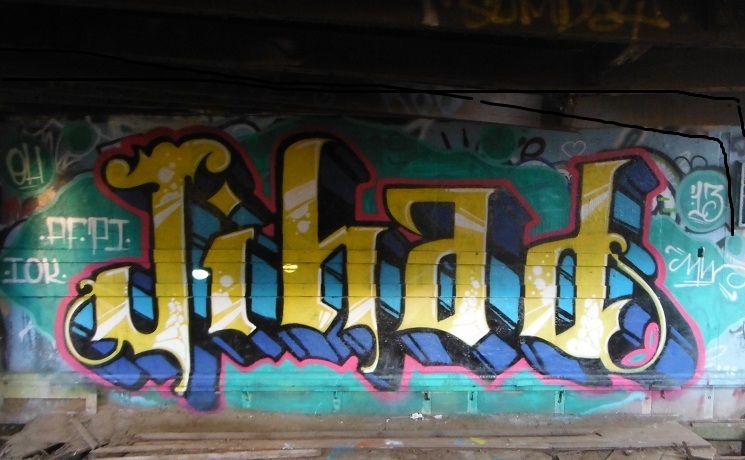 What does Jihad mean nowadays? Is Jihad an islamic form of terrorism ? Is Jihad an avatar for Islam ? Is violence inherent to Islam ? Is the islamic faith a disturbing element towards peace on earth ? So many questions that need clear and audible responses. Mohammed Arkoun draws our attention to the fact that the word « Islam » is often translated into French as « soumission » (literally « submission» in English). However, islam, etomologically, in it’s original arabic language, means « delivering something to someone ». It would therefore be more exact to translate the word islam as « delivering oneself to, trusting totally, in God. The Qu’ran forbids forcing people into religious matters. The word islam has also the etymological root »salam » which means peace. Peace is central in the Qu’ran « O you who believe, enter into islam wholeheartedly ! » . Being at peace and advocating peacefulness are sacred. In parallel to this, one of the glorious names of God is « Peace », and five times a day Muslims call upon God with this attribute in their prayers. Being in peace comes from an intimate relationship between the human being and God, as well as a strong spirituality. Having defined Islam, let’s now look at its link to violence and in particular to the idea of Jihad. The word « jihad » is often translated by « Holy War » whereas the term « holy war » translated back into the arabic language is « Al Harb al-Mouqaddassa ». This term does not exist anywhere, in none of the fundamental islamic texts, nor in any Islamicliterature. The incorrect vision of an islamic jihad dates back to the medieval crusades. The idea of a holy war engaging Muslims, in the name of their faith, in a war of conquest in order to oblige people to convert to Islam does not exist in Islam. The Qu’ran expressly forbids compelling anyone over religious matters « Let there be no compulsion in religion » . It would be impossible to propogate the Islamic faith by force, even when it is ardent and sincere, as that would go against the very essence of the message. The word Jihad stems from the root « ja-ha-da », which means to make an effort, and does absolutely not correspond to violence. This effort consists in carrying out a victory over oneself, against our own violence, our violent attitudes. This is the greatest of all victories. This jihad, called generally « jihad an-nafs » « effort on ones ego » is central to muslim spirituality. It is this effort that enables us to control our violence and anger, thus lifting us morally and spiritually. Indeed, Jihad can take the form of an armed effort : Al Qitâl, but this effort has always been strictly regulated. Armed combat is only authorised in order to protect oneself, or in cases of legitimate defence. For 13 years at Mecca the Muslims used non-violence as a means of resistance in spite of being persecuted and isolated with the social and economical embargo. Then when they got to Medina, God gave them permission to defend themselves « Permission is given to fight, because they are wronged, and verily God is the most powerful for their aid. They are those who have been expelled from their homes for no cause except that they say « Our Lord is God ! » . In the case of legitimate defence, when all other means to stop the agression have failed. In the case of persecution, of property being taken. In order to free people from dictatorship. Omar Ibn Al-Khattab, the second calife after the Prophet Mohammed (Peace and benedictions upon him) freed Jerusalem from the byzantine occupation without a single drop of blood being shed. Another interesting example is that of the Emir Abdel Kader, a hero of the Algerian resistance, who fought bravely against the French colonisation. He set himself up in the Syrian capital, and from there, played an important role in the riots of 1860. In the name of the Islamic faith, he saved thousands of Christians from being massacred. His exemplary behaviour provided him with numerous declarations of thanks and decorations (6). The notion of jihad is therefore one of effort : an effort on oneself, an effort to gain knowledge, an effort in development….and absolutely never an ideology, which in claiming to be islamic, betrays the very vocation of peace and justice, and prones terrorism and assassinations as means of waging war. The Qu’ran declares : « if anyone slew a person – unless it be in retaliation for murder – or for spreading mischief in the land, it would be as if he slew the whole people » . The sacred text is one thing, the reading and the interpretations that men make of it is another. Sacred texts can be instrumentalised by extremists of all kinds. Is Islam inherently violent ? Does the Qu’ran incite violent behaviour ? Or is it that men will pretext anything, including in God’s, the Prophet’s or the Qu’ran’s name to justify and legitimise their own violence and their own fanatism ? It is important to point out that terrorism has no religion. However, what is striking Today is that the means of communication used by the jihadists to give their doctrine a planetary echo, attracts and recruits young people. The jihadists use internet, especially the social networks and diffuse videos preaching hatred. The video games such as « Call of Duty » are also used to charm young candidates to jihad. It should also be noted that jihadlsm is attractive to individuals with broken ties with their family and society at large or who are psychologically distressed. For youth with no guidance, jihadism is a career. In view of these phenomena, with such serious consequences for our society, we should commit ourselves to favorising dialogue and mutual enrichment, refusing amalgams and combatting all ideologies preaching violence, provoking and legitimising terrorist crimes. We should also favorise education and citizen participation in order to eliminate the conditions which encourage the proliferation of violence and the extremist way of thinking. M. Arkoun, Ouvertures sur l’islam, Grancher, 1992, p. 35. Qu’ran: 22 / 39 – 40. Salah Stétié, Culture et Violence en Méditerranée, 2008, Imprimerie nationale éditions, p. 128. Cette entrée a été publiée dans Article en anglais, Article Omar MAHASSINE, Djihad, djihadisme, violence, et marquée avec Djihad, Djihadisme, Imam omar mahassine, Paix, Témoigner de sa foi, le 03/17/2015 par Omar MAHASSINE.